When I first saw my mother-in-law after telling her that I was pregnant again, she gave me a book. My in-laws are big givers of books, which I don’t dislike at all. 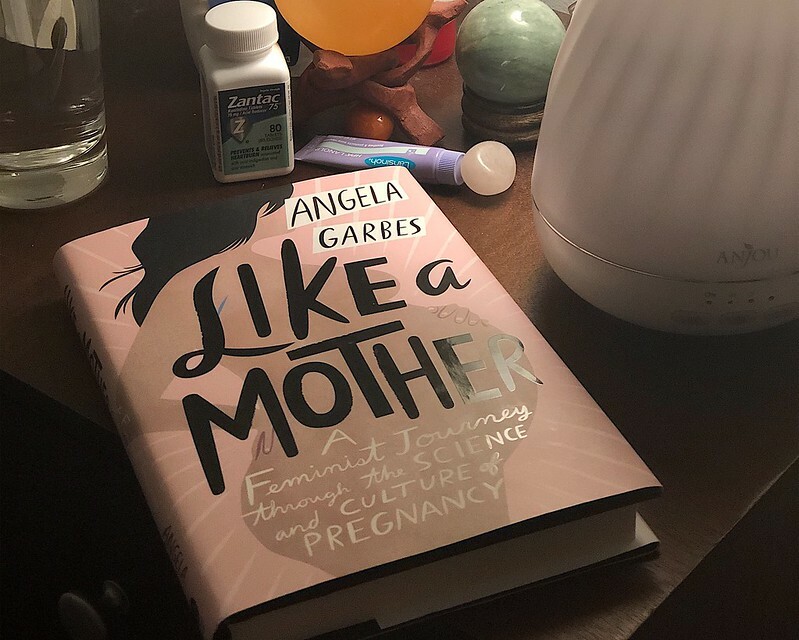 This book was by a woman that she’d heard interviewed on NPR about a piece she wrote about the intricacies of breast milk, and is titled Like a Mother: A Feminist Journey Through the Science and Culture of Pregnancy, by Angela Garbes. The author is a woman who had her first child at the age of 36 after suffering multiple losses, including one right before she got pregnant with her daughter, and while pregnant, spent a lot of time researching best practices for pregnancy and child-raising. She found that there is not only a lot of conflicting science, but cultural aspects of the investigation of that science. So she wrote a book about it. First of all, I’m sure plenty of people have heard of Expecting Better, Emily Oster’s simultaneously controversial and lauded book about how pregnant women can drink alcohol if they want (it’s actually about learning how to make your own decisions in pregnancy, but for some reason, people mostly latch onto the alcohol thing). I read that book when we first decided to start trying for a baby and found it immensely informative (albeit not entirely so on the one topic that actually comes up every single day for me). But Garbes’ book isn’t about statistics or studies, really. Yes, she talks to some renowned experts on the subjects she covers, but ultimately, her aim is to place pregnancy, childbirth, and postpartum care in a broader cultural context. Her book really speaks to me as someone who gets fascinated by a subject and wants to learn everything about it. Her treatment of breastfeeding and human milk shows this nuance. Plenty of sources are quick to point out that the concrete evidence of the benefits of breastfeeding tend to fall away when researchers attempt to correct for the confounding effects of socioeconomic status (i.e., a lot of affluent women breastfeed because they can take the career hit that it can cause, but their babies probably do better because they’ve been born to affluent women). But she goes deeper, investigating the actual research into the constituents of human milk itself and the mechanisms of breastfeeding that could have positive effects for a baby. She still completely acknowledges that modern formula is absolutely healthy and there isn’t any proof of the benefits of breastfeeding, but it’s interesting to see beyond studies of the overarching effects of breastfeeding on a baby. She treats other topics similarly, from placentas to kegels. Through it all, the main thread is acknowledging that women are integral from this process, and yet their role sometimes gets ignored in favor of focusing all attention on how the baby is doing. When studying anything related to pregnancy, whether it’s induction or soft cheese, people tend to focus on how it will affect the baby, rather than looking at the whole picture. Garbes makes sure we keep in mind that the mother is a part of this, not just a vessel. And this is so important. From her early chapters on loss to her later chapters on the transition she felt after bearing a live child, she stays connected to her own journey and changes as a proxy for the changes the reader might be feeling. I know that I have had some trouble struggling with the fact that, while my family and friends are largely supportive and excited, most of them are excited for the baby, and seem to see supporting me as tangential, especially when discussing plans for visiting after the birth. Interestingly, the ones who ask me the most about how I’m doing are the ones that have gone through this themselves, particularly the recent mothers. On the other hand, while I’m still a person in my own right, I appreciated Garbes’ willingness to put into words the feelings of loss and rebuilding of identity that comes with pregnancy. Particularly as I near the end of my pregnancy, I’m starting to realize that just as our life will never be the same, I will also not be the same as a person. So I think this book is a great read, particularly for someone currently pregnant. I actually found it interesting to read it multiple times during my pregnancy, the first time right near the beginning, and again as I neared delivery. While it provides some really interesting information, it is not primarily a “how to baby” book, but instead a seamless marriage of information, context, and personal narrative that helps the reader think about her own place as a mother in society. NB: Links are non-affiliate and I haven’t been provided any incentive to review this book. All thoughts are my own.